Bats are fascinating little creatures and, when you think about it, very cute! With over 1300 species of bat, they are the world’s only true flying mammal. However, all is not well in the world of bats. 25% of bats are on the brink of extinction, which is a sad and horrifying amount. At least 12% of bat species are extinct already. Bats are a vital part of the planet’s ecosysytem – they eat insect pests, they pollinate flowers and disperse seeds in their droppings. In the UK, some bats are “indicator species” – changes in these bat populations can be indicative of changes in biodiversity. Over 500 plant species depend on bats for pollination – without bats there would be, for example, no cocoa or bananas. Good news – you can help make the future a bit brighter for these little darlings – support the Bat Conservation Trust, make your garden wildlife-friendly and give your wedding guests bat-friendly seed packet wedding favours to encourage them to help too! 70% of all bats and UK bat species only eat insects. In fact, the common pipistrelle (UK bat) can eat as many as 3000 small insects a night! Planting wildlife-friendly flowers will be helping feed the bats. Bats mate during the autumn and sometimes into the winter when they hibernate. The females then store the sperm and do not become pregnant until the spring. Pregnant females gather together in maternity roosts to have their young. Pregnancy lasts between 6 and 9 weeks depending on the species and can be influenced by weather, climate and availability of food. Females usually give birth to a single baby each year, which they keep close to them and nurture. 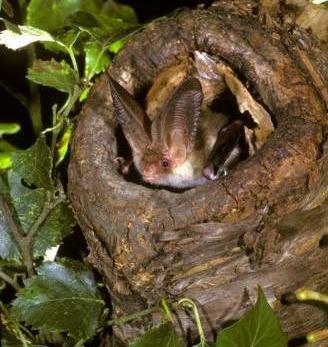 Bats roost in houses, hollow trees or caves or any small crevasse they can squeeze into! Worldwide, bats can be as large as a dog or as small as a bee (although our UK bats are much smaller in size compared to a number of tropical species). As many bats roost in buildings, humans are a major threat to them. Building works at the wrong time of year can cause major disruption to local bat populations. 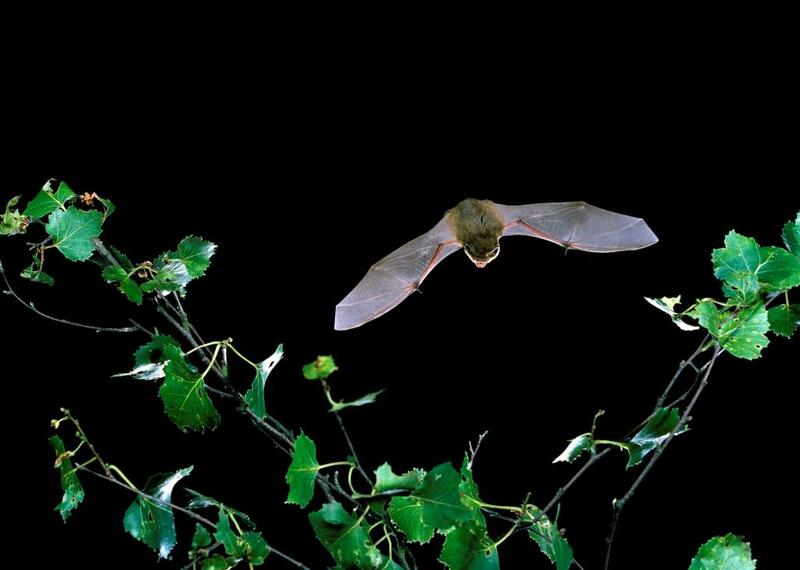 Pesticide use, intensive farming practices and loss of habitat have all played a part in the decline in bat numbers because they have resulted in a major reduction in suitable habitat and the number of vital insects that bats need to feed on. For example the change from hay-making to silage, has meant that many insects do not reach adulthood so there are less flying adults available as food. Changes in climate may also influence insect life cycles and so this may affect when bats can feed. There has also been a negative effect on bat numbers due to the erection of wind turbines on migration routes and in the vicinity of hedgerows. The construction of roads has the potential to negatively impact bat populations, through loss of roosts and foraging habitats and by destroying landscape elements that bats may use as commuting routes. Roads create open spaces, which many bat species are reluctant to cross. Then there is the issue of traffic itself – sudden movement, noise, headlamps, street lighting and the risk of collision. Most species of bat fly relatively close to the ground or close to trees and hedges for protection against the weather and potential predators. Those bats that do cross roads typically do so at traffic height, with a high risk of collision. Research shows that roads also have a major negative impact on bat foraging activity and diversity. If you are anything like me, you get excited at the sight of a bat flitting around the garden at dusk. You can help and encourage bats by planting bat-friendly wildflowers to attract the insects that bats eat. The scarcity of natural habitat for wildlife means that gardens play a very important role in helping their survival. If you are into bats and want to help them even more, a wedding is the perfect time to spread the word! Give your guests our bat-friendly seed packet wedding favours which contain Ox-eye Daisy and Red Campion seeds to encourage insects into the garden. You will also be helping Bat Conservation Trust in their work with bats – a donation is made from every packet sold. 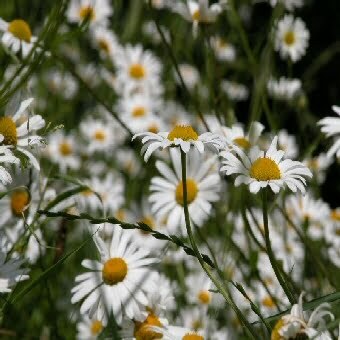 Ox-eye daisies are large white and yellow daisies that grow to about 2ft in height. 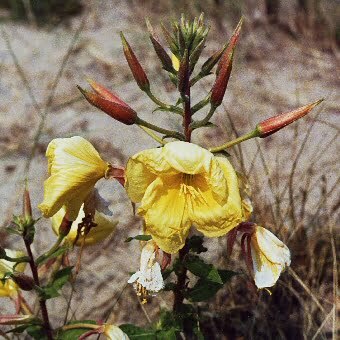 They flower for ages, from around May to October or later and are perfect to attract all sorts of insects. They like full sun, germinate very easily and self-seed well so will spread around the garden if the seedheads are left on. They look amazing planted in drifts around the garden or in the lawn. 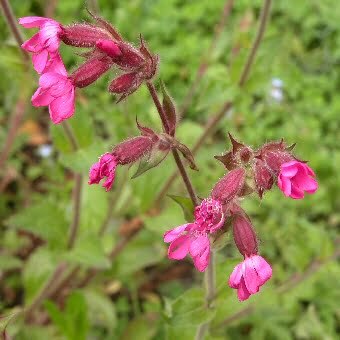 Red Campion is also about 2 ft high and has very pretty pinky-red flowers. 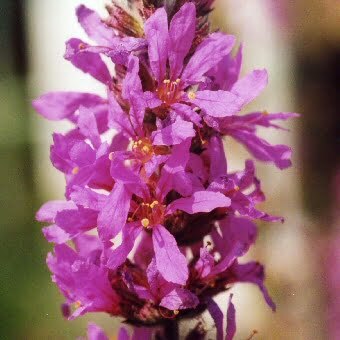 It is a good nectar plant and will also attract lots of insects. It will also grow in partial shade and even full shade. It flowers in early spring so is an important early nectar source. If you find a bat on the ground, especially during the day, then it probably needs help. Wearing gloves or using a soft cloth, pick it up and put it in a container and then call the Bat Helpline on 0345 1300 228. Further, more detailed advice can be found on the Bat Conservation website. An amazing charity that we are so happy to support. Please visit their website and consider joining as a member, your money will be well spent and will help towards stopping the decline of these enigmatic little creatures! Their website also has absolutely loads of information on everything to do with bats. You can also volunteer to help them in their work and join your local bat group.